Dooby, the legend behind the infamous Lobagola Bed & Breakfast in Zagreb, Croatia. He has been immensely helpful since the day I arrived in Croatia and broke my clutch cable. I’m told the friendliest people in Croatia are from Rijeka. With my exhaust, sparkling and sounding as if new, I decide to explore one more place before crossing the border between Croatia and Slovenia. Located at the Southern end of the Istria peninsula, Rijeka is a port town and the gateway to the islands of the northern Adriatic and Kvarner Bay. With this as my destination, Dooby pulls out a few maps and we sit around a table in the Logobola lounge to discuss the best riding route to get there. He tells me about the coastal road from Karlobog north to Rijeka. Together we map out a route that crosses the mountains and avoids the superhighway toll road by passing through small towns and tiny villages including Josipdol, Otocac, Licko Lesce, Perusic, Gospic until winding down to the coast at Karlobog. The shortest distance between two points doesn’t matter. You can see here I took the long way to get to Rijeka. The coastal cruise worth the extra 4 hours of riding! It takes just a dozen kilometers or so as I head north toward Senj that I know why motorcyclists, especially those knee-dragging, sport bike speedsters love this road. It twists, turns, climbs, descends and carves its way north while huggging the sometimes rugged coastline. The road twists and turns down and up the mountains along the coast between Karlobag and Rijeka, passing through the busy coastal town of Senj. Doc happy and purring with its new exhaust tune up! Closer to Senj the road hugs the Adriatic Sea. Scenic and many islands dot the coast as I make my way north! To the west the Adriatic is dotted with small islands, some with craggy mountains that dramatically silhouette against a sky transforming in a kaleidoscope of colors. My bike with its glistening ‘new’ exhaust purrs as I motor north to Rijeka. I wind around the bay and drop into Rijeka, which tumbles from the steep hills down into the port. It’s quiet, there’s not much traffic save a few public tranit busses and a few scooters. I find a hotel just outside the pedestrian promenade, park and cover my bike and head out for a bite and glass of wine. 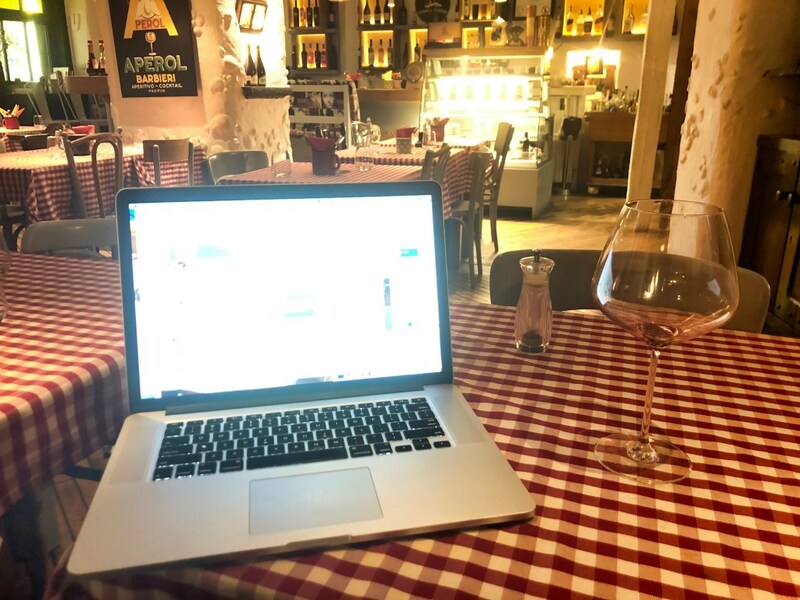 The server at the modest and cozy wine bar and Italian restaurant, complete with red checkered tablecothes, is friendly and eagerly pours me local wines from the famous Istria peninsula as I use the Wifi to write about the last few days and research for the days to follow. 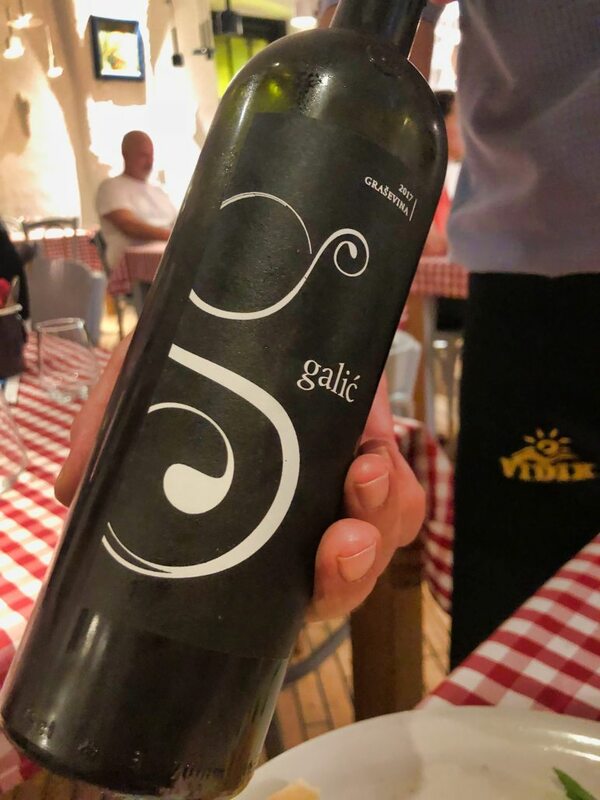 Lovely crisp Grasevina from Istria. Friendliest people in Croatia? They could be here. And if my server is an example of a local, I’m a believer. Yet I will not have an opportunity to explore this town, nor much of Istria. Slovenia calls me. So does a one night stop in Italy. Tomorrow I’ll pass through Slovenia, take a quick ride to Trieste, then back to Slovenia the next day. I can’t be this close to Italy and not swing by to say hello. Thank you Angel!! I hope you’re well and smiling!! Awesome road, Allan! It’s nice to know you´re OK and rocking! Regards from Argentina. Darío.